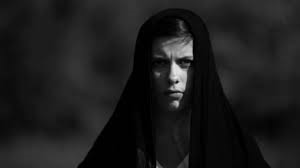 Director Christopher Di Nunzio (2011’s “Her Heart Still Beats”, 2015’s A Life Not to Follow) continues to astound with his fifteen minute short film from 2014, “Under the Dark Wing”. Released through Creepy Kid Productions this is a darkly poetic, hypnotic and utterly unique take on the paranormal tale. 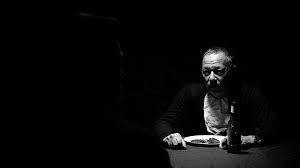 This brilliant work, which plays like a combination of Ingmar Bergman and Martin Scorsese, is enriched by Nolan Yee’s gorgeous black and white cinematography. Further enhancing the visual appeal of this already dazzling endeavor is Di Nunzio’s masterful direction. In particular, his apparently effortless knack for framing alluring shots. Alongside this, Di Nunzio summons mesmerizing angles which heighten the sense of claustrophobia, always a necessity for thrillers such as these, on-screen. An extended conversation in a secluded area, an office of sorts, between Johnny Boy (a riveting, nuanced performance by Fiore Leo) and George (in a portrayal by David Graziano which is suitably menacing and extraordinary), which takes up most of the first half of the effort, are where such touches are most evident. But, it is also present in a beautifully rendered moment where Johnny Boy walks cautiously through a field, his left hand extended before us as if guiding, as the camera treads scant inches away from the young man. This is all a compelling build-up to coming face to face with The Girl (a fascinating enactment by Jessy Rowe which exhibits the character’s underlying currents of power and vulnerability spectacularly well). Di Nunzio also captures the isolation of the characters, and the region in which they dwell, with shots of largely empty streets and abandoned buildings. Such elements immerse us in the mind of Johnny Boy, as he treads through them in the affair’s earliest moments, instantly. These are all indicators of the high-arena of technical conception Di Nunzio and his crew are laboring at throughout. The narrative revolves around Johnny Boy, who claims to have been drug free for a year, returning to his boss, George. Frustrated, Johnny Boy relates the failure of his past job, where he was supposed to slaughter a C.E.O., to the presence of a young girl. But, when an enigmatic female figure begins to find her way into the lives of the two: George is blind-sided by the idea of the profit she could bring in. Immediately afterward George and Johnny Boy begin to realize that the fate they thought they had a firm hold of could be in someone else’s hands entirely. “Under the Dark Wing” grabs ahold of our attention immediately, with a sharply done title scene, punctuated by the exclamatory clattering of bells, and concludes on a just as impressive climactic note. The piece is propelled by cryptic, noir-like dialogue. It is also fashioned with a non-stop pace that is both quick yet, authentic and brooding. Not only does this tighten the already wire-like grip on underlying suspense Di Nunzio has fabricated but, it adds heightened style, menace and intrigue to an already white-knuckle horror effort. What mechanizes just as tremendously to its acclaim is that it unveils a manner to develop its characters cleverly, through wordplay and ominous, poetic and visually stunning images that never shatter the tense guise hovering over the entirety of the project. Furthermore, they never seem artificial. This is as much a testament to Di Nunzio’s masterful guidance of the exertion as it is the intelligent, beautifully constructed screenplay he penned, from a story Di Nunzio (who has an uncredited role as the Dead C.E.O. in this venture) is solely attributed with conceiving, with Pedro Alvarado. Di Nunzio, among his many prodigious contributions here, gives us music that is cloaked in temperament, perfect for the material and only adds to the classic veneer which hangs over the proceedings. He also contributes editing which is proficient, seamless and as eloquently crafted as the endeavor itself. The involvement from the rest of the crew is just as spectacular. Special make-up effects artist, Jessica Van-Winkle, does an astounding job with her respective participation. Boom-operator/ sound-recordist, Laura Grose, delivers sound that is crisp and alive. Alex Huang’s camera influence is terrific. Keith Bennet, who appears in the role of The Thug, is gripping. He makes an incredible impression with his brief time on-screen. With “Under the Dark Wing” and the feature film he created one year later, A Life Not to Follow, Di Nunzio has proven that, not only he has absolutely mastered the creation of mature, grimly stunning and thoughtful thrillers. His characters are credibly etched, a vigorous facet which makes him stand triumphantly above the legion of those who toil in similar genres with antagonists and protagonists practically indecipherable from similar cinematic ventures. His stories walk the ledge of reality so well that we, the audience, never have any problem believing what our eyes are seeing. Not only is this because of the impeccable way he develops the personalities on-screen but, because he puts them first and makes us care for them all. It is a feat that many attempt but, few can pull off in such a consistently entertaining manner. Di Nunzio is an astonishing filmic auteur and “Under the Dark Wing” is every bit as tremendous as the other entries in his varied catalogue. Writer and director Antonio Padovan’s twelve and a half minute short, “Socks and Cakes”, produced by Kimistra Films, is exhilarating entertainment. It is a sly comedy with delicately woven dramatic touches that is stylistically and tonally reminiscent of a Woody Allen venture. The magnificent composition wins its audience over immediately. Such is accomplished with both its widely relatable characterizations as well as a deftly honed screenplay (courtesy of Padovan). It is one filled with biting observations about life itself. The clever dialogue sharply reflects this characteristic. Often, its most effective humorous bits echoes such components. We laugh with those on-screen as we nod our heads in agreement. The serious bits are just as potent. This is because they evoke these attributes and hone them in a way that is not only sentimentally riveting but, intensely credible. For example, a stirring monologue delivered near the finale regarding the drudgeries of daily labor and other responsibilities gradually replacing dreams as one ages and matures is where such qualities are most evident. The commonplace attributes of those included within make their likability all the more transcendent. In turn, this becomes all the more accessible to a wide, varied audience. The result is a delightful concoction. It is one which is well-rounded, intelligent and uniquely meditative. Padovan’s tale concerns five individuals who meet at a dinner party in Greenwich Village. Discussions of the past, the present and the future inevitably intermingle as the guests await the preparation of their meal. All the while, the chief personalities attending this event try to keep about a proper, respectable air as secrets involving these individuals are released. Emotions resonate but, seem to be pushed to the side until they can no longer be contained. This is where the piece gains its hefty dramatic intensity and sentimental resonance. Such arrives as the endeavor becomes largely a succession of clandestine talks between pairings of exes, lovers and friends after its stupendously mood-setting opening credits, which is resurrected just as successfully in its end acknowledgments. These segments are complete with fitting selections of music that only enhances its warm, hypnotic effect. The topic of the production largely concerns the various relationships of the leads. It toys with the idea that men and women can attain pure friendships. This is, of course, after an isolated incident of giving into initial passions(as the French literature professor Harry Mogulevsky, a sophisticated and outstanding enactment by Timothy J. Cox that is pitch perfect for the material, informs us in one of his several Shakespearean lectures to the audience). Not only does this provide one of the most comedic moments in the effort but, it provides a grand example of the appropriately subtle manner in which such instances are handled. The laughs are beautifully woven into the fabric of the narrative. Such is done in a way that doesn’t take away from the overall effect. Instead, it enhances the sensibility that one is watching a collection of close-acquaintances, people we immediately sense we’ve known for a long time, gather, reminisce and indulge in great conversation. The smartly smooth pace mimics this illusion of being present to what transpires; a silent comrade as the measures of the account unfold. Yet, Padovan also concerns his brief work of cinema with decision. Primarily, the ones which existence wields at us unexpectedly. This is most notable in its open-ended resolution. Not only is this a perfect punctuation point for the endeavor but, it draws the audience in all the more. Because of this the proceedings become all the more warmly intelligent, personal and gripping. What also makes the effort all the more impactful is that it contains beautiful performances all around. Kristy Meares embodies the character of Amanda, Mogulevsky’s ex-wife, masterfully. Jeff Moffitt is terrific as the architect, Richard, Amanda’s present spouse (who just happens to be Mogulevsky’s best friend). Ben Prayz, as jovial and joking David, (whose impeccable comedic timing is utilized to great effect throughout) and Alex Vincent, as Sophie, fare just as spectacularly. The affair also boasts gorgeous cinematography by Alessandro Penazzi and Redmond Stevenson. The veneer found on-screen is classy, elegant and natural; creating an immaculate visualization of the demeanor and atmosphere found in both the antagonists and beneath the surface of the material. 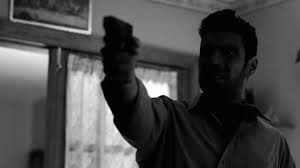 Padavan’s direction is marvelous and his editing is seamless. Jackie Caruso’s use of make-up is phenomenal. Robert Albrecht’s sound is stellar. The same can be said for the art direction from Gabriela Guidino Jaime. All these wonderful elements come together strikingly well; the charm of the composition is infectious. Because of these wonderfully constructed technical elements the composition radiates triumphantly from the screen and into our own hearts. Among the many fantastic feats Padovan and his filmmaking crew accomplishes here is how we leave this brief bit of cinema feeling that we have known the characters on-screen intimately all our lives. Padovan provides rollicking glimpses into those who populate his story through speech that is consistently fascinating and exposition that is just as natural and engaging. The fact that the exertion is so beautifully crafted, acted and provides such an exceptional example of the power of nuance makes the effort all the more admirable. Padovan’s ambitions to discourse on the human condition in such a quaint setting is all the more awe-inspiring. The reality that this is executed as brilliantly and effortlessly as all the high-caliber herein makes the piece all the more worthy of our time and attention. 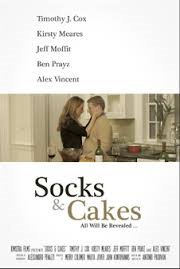 “Socks and Cakes” is terrific.